Posted on March 19, 2019 at 8:41 am. 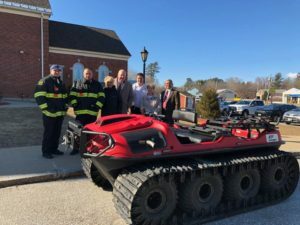 The ARGO Rescue vehicle, ordered by the Seabrook Board of Selectmen last year, has arrived in Seabrook. Our first responders are training on this vehicle, which will allow them to reach those in distress that are in difficult to reach areas. While it will be of significant assistance to rescue personnel on Seabrook Beach the vehicle can be deployed town-wide. A big thank you to the D’Allasandro Fund, which financed the purchase, allowing us to increase public safety at no cost to taxpayers. Press coverage of the ARGO purchase.